Mint, Intuit's popular personal finance app and long-time favorite of ours here at Android Central, has finally been given the Honeycomb treatment in its latest update. Available now in the Android Market, Mint's tablet attire has all of the features included in the smartphone version, along with a few extra goodies, including an updated overview page, spruced-up spending graphs, and a very handy offline mode. For those unfamiliar, Mint is a free app that aggregates your financial accounts into an easy-to-read layout. Mint shows you when your money is coming in, when it's leaving, and exactly where it's going. All information is updated in real-time, and with the tablet version's new offline mode, you'll be able to access all of your financial information as it was at your last online sync. If you've already been using the Mint app on your tablet, simply upgrade from the market for the new Honeycomb-optimized version. Intuit's full presser, along with a market link, is waiting at the jump. MOUNTAIN VIEW, Calif.--(BUSINESS WIRE)--Android tablet users can now manage their money and visualize their spending on interactive graphs with the new Mint.com personal finance app. 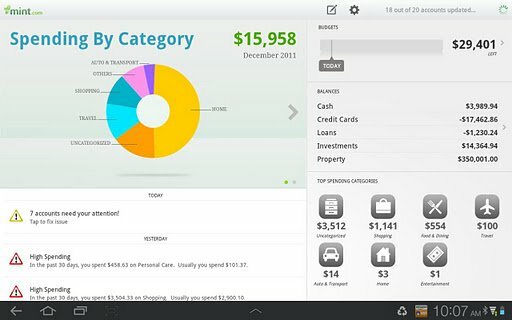 Free to download from the Android Market, the new app brings Mint.com’s award-winning service into the hands of Android tablet users, and transforms their transactions into easy-to-read graphs. The result: A clear picture of their overall spending by category or by date range and a better understanding where their money is going. With this launch, Mint.com’s mobile portfolio now includes apps for both smartphones and tablets on iOS and Android platforms, providing on-the-go access to its nearly 8 million Web and mobile users. Organize all accounts: One tap gives users a complete overview of their finances; helps them review account balances and automatically categorizes transactions. Obtain financial insight: Detailed graphs drill into spending by category, such as food, clothing and travel, or spending over time; provide customizable date ranges for a personalized view. Stay on top of spending: Personalized budgets track spending help users reach financial goals. Get personalized updates: Streaming delivery of account alerts, bill reminders and personalized advice provides the most up-to-date information and helps people make smart financial decisions. Track cash spending: Enter cash transactions while on the go to more accurately capture spending. Easily find transactions: The search bar helps users find specific transactions or purchases by merchant, category or tags. Review finances anywhere: No Internet? No problem. Storing information from the latest download allows easier viewing of finances, anytime, anywhere. Intuit’s unique approach to innovation helps it quickly adapt products for tablets, according to a recent report from Forrester Research. Mint on the Android is the latest example, joining a robust lineup of mobile solutions that are changing the way people manage their finances around the world. For full information on Mint.com’s other mobile apps and services, please visit: https://www.mint.com/how-it-works/anywhere/. Mint.com is a leading online personal finance software service from Intuit Inc. (Nasdaq: INTU), providing nearly 8 million users a fresh, easy and intelligent way to manage their money. And it’s free. Launched in September 2007, Mint.com has quickly grown to track nearly $1 trillion in transactions and $485 billion in loans and assets for its users. Mint.com’s innovation is in applying advanced technology to deliver breakthrough ease-of-use. Using patent-pending technology and proprietary algorithms, Mint.com allows users to see all their financial accounts in one place, makes it easy to set and keep to budgets, and helps identify money saving ideas. Mint.com is so effective that more than 90 percent of users say they have changed their financial habits as a result of using the service. For more information on Mint.com's free online personal finance service, please visit http://www.mint.com and follow Mint.com on Twitter: www.twitter.com/mint. Founded in 1983, Intuit had annual revenue of $3.9 billion in its fiscal year 2011. The company has approximately 8,000 employees with major offices in the United States, Canada, the United Kingdom, India and other locations. More information can be found at www.intuit.com.